Oooooh you deep deep vampy shade. I love you. You are awesome. When I saw pictures of this beauty swatched over at Nails and Noms it was the last confirmation needed to go and buy this polish. I doubted for so long but this just made my decision final. The reason I was in doubt was the price, I usually don't pay more than around 5 euro's for a polish. But this was worth the exception I make every once in a while. The fun thing about this polish is, that the base isn't a red, burgundy or purple as you might think. No. It's a dark, inky, blue. Blue! When you take out the brush it looks so weird to see a dark blue run down the bottleneck. The gorgeous think about it is that it makes the polish so much more interesting. 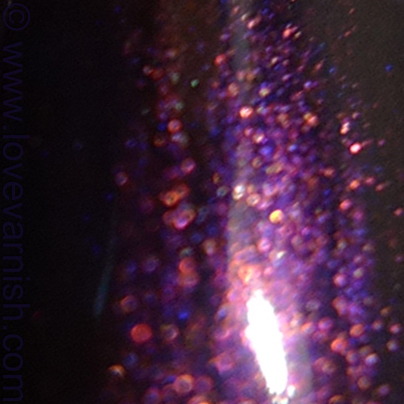 Because the blue base and the vampy red/purple/gold shimmer influence each other in different lighting this polish can appear purple, copper, red and everything in between. I used 2 easy coats for this, only thing you need to be is careful about cuticle flooding. It doesn't pool very easily but if it does.. the blue is dark. And inky. Not as tough to cleanup as I thought but not easy either. We will get this brand here soon! I'm looking forward! Very very pretty! Like it!!! Wow, what a gorgeous color! So pretty!! I agree, it looks like OPI Every Month is Oktoberfest. This is absolutely stunning on you!!! Love that gorgeous shimmer! It really is! Thanks Alexis! Which means I have one polish less to buy ;)! They have some pretty shades ^^. Thank you Kelly, it is! Thanks Marisa, the shimmer is indeed awesome! I love the dark side ♥.